What is a dash cam? Read our guide or watch the video below. If you're still not sure whether you need a dashcam, have a read of our guide Why buy a dashcam?. At first, the process of choosing a dashcam can appear daunting and the multitude of different cameras and brands can feel like a minefield. And then when you've narrowed your choice down, the technical details can confuse you even further! From the wide range of video resolutions available to different memory and mounting options, identifying the right dashcam for you can seem impossible. So we've produced this guide to finding the right dashcam to help you narrow down your selection and find the right camera for you. We regularly get asked which dashcam we recommend, and we're always happy to offer an opinion, but the ideal camera for you is dependant on the features that you're looking for. You can find out more about the features that are common among dashcams in our guide to the key features of car cameras, but here's a closer look at the options that you should consider when picking your dashcam. They say size isn't everything, but it's an important thing to consider when choosing your dashcam. Most people opt for a small, discreet camera as they believe it's less likely to be spotted by would-be thieves, and also has less impact on the drivers view. Both very valid points, but small car cameras are also likely to have less features, or require external devices to enable options such as GPS or wifi. This is because there simply isn't enough space inside for the components required. Larger cameras often feature screens too, which can make viewing footage and adjusting menu settings easier, and can usually be hidden very neatly behind your rear-view mirror so needn't interrupt the drivers view of the road. Our favourite small cameras are the Mobius for it's tiny camera size and the Mini 0801 and Mini 0805 cameras which have a small footprint including mounting. Needless to say, the amount you have to spend is a key factor in any purchase, and as far as dashcams are concerned there is a camera to suit any size of wallet! But how much should you spend? Well, it really depends what's important to you. While all of our cameras record outstanding footage, budget cameras may lack the build quality or refinement that more premium, big brand cameras offer. More expensive cameras may also offer advanced features such as wifi and touch screens, and are generally more user friendly too, so it's important to decide what matters to you most. Your cameras resolution refers to the quality of the video that it can record. The higher the number, the better the quality. And when you may come to rely on your footage as evidence, it's important that you've done everything you can to capture as much detail as possible. 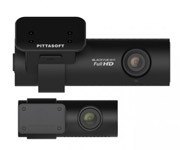 While almost all dashcams record in high definition (HD) nowadays there are still different levels of HD quality, from 720p, 1080p and even 1296p. (Don't worry about the 'p' at this stage!). The higher quality settings mean that your camera needs to store more data too, so memory card capacity needs to be considered also. For maximum protection, dual-lens dashcams offer cameras at the front and rear to record activity on the road in both directions. In these setups, the front camera usually acts as the main unit, managing all of the image processing, power and memory, which means that the rear unit can be much smaller, having less impact on rear visibility. The two cameras are often connected by a long cable which can easily be routed through your vehicle. Dual-lens setups usually include software that makes it easy to view your video and quickly flick between the front and rear view to give a clear picture of events happening around you. GPS allows your dashcam to monitor your location, and uses this information to plot your route on a map when you view your footage using the software provided with your camera. It also enables your camera to calculate your speed, which can offer vital information in the case of an incident. Some customers feel that this information can could count against them if they happen to be over the speed limit, so you may choose to disable any options that may stamp details of your speed onto the video if you're slightly heavy-footed! Almost all dashcams record their footage onto a Micro SD memory card which slides into a small slot on the outside of your camera. While these cards are all the same size physically, some offer a greater capacity and can hold more video. While some will argument that in the case of an incident you only ever need the last few minutes of footage, memory cards can accumulate files that are protected from being overwritten as the camera has determined that something of note happened while recording that video. These can reduce the amount of available space on your memory card unless you empty it regularly. Therefore, a larger capacity memory card can make this easier to manage. You can read much more in our guide to memory cards. If you've even returned to your car to find it damaged, and the culprit long gone, then parking protection will be of interest to you. In this mode, your dashcam will use motion detection technology to monitor activity around your vehicle and record a short clip if it detects any significant movement. It will also start to record if it feels a bump or knock using it's internal g-sensor and start to record. In both cases, your car camera could well capture footage of the guilty party which can help you to track them down. For more information, read our guide to parking protection. Dashcams rely on there being a source of light in order for them to record useable video and some perform better in low-light situations than others. All cameras will capture useful footage if you're driving in areas with good street-lighting , but if you spend a lot of your time driving at night then you should consider a camera with a wide dynamic range (WDR). This is sometimes referred to as a high dynamic range (HDR) but both terms refer to the cameras ability to process data effectively in low-light conditions and digitally enhance the footage to deliver improved results. Almost all car cameras include an internal g-sensor which measures movement across three axis; up and down, left and right, forwards and backwards. Using this information, the camera can identify sudden or severe movement, such as braking heavily, swerving erratically or a significant collision, and can protect the video being recorded at that time from being overwritten. However, you may like to be able to protect video files manually too. If you witness an incident on the road around you that you would like to retain a record of, some dashcams feature an event record button which can be pressed and the footage being recorded at that time will be kept safe until you need it. Dashcams are ideally affixed to your windscreen, behind the rear-view mirror, and this is done by the means of either a semi-permanent adhesive mount or a suction mount. While adhesive mounts are usually smaller and more compact, which can help your camera to remain discreet, a suction mount will offer a degree of flexibility, as it can be repositioned and removed from the vehicle as required. 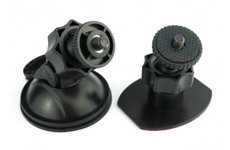 Most dashcams can easily be removed from their mounts, which is an important consideration for the security conscious. LCD screens have several benefits, making it easy to watch your recorded footage, change menu settings and align your dashcam so that it is pointing in precisely the right direction. Some cameras even offer touch screens which make navigation simple and intuitive. For cameras that don't feature screens, these can often be connected to tablets and smart phones via wifi, so that a screen is not required and the camera itself can be kept as small and discreet as possible. As mentioned above, some dashcams offer a wifi connection so that you can use your tablet or smartphone to review footage, adjust settings or watch a live feed to help when aligning your camera. When activated, your dashcam will produce it's own wifi hotspot that you can connect to with your device. You will need to download a specific mobile app for your smartphone which will then allow you to connect to your camera. We often get asked if wifi means that you are able to connect to your dashcam from anywhere in the world via the internet, but this isn't the case; your wifi hotspot has a range of 5-10 metres. As standard, dash cams connect to your car via a cable to the cigarette lighter socket (just like a sat nav). However, some of our customers prefer to hardwire their camera into the car electrics. This means that there are no cables on show and you have a free cigarette lighter socket available for other car devices. When you hardwire the camera you can choose to wire it to a circuit which is powered all the time, meaning you can take advantage of the parking protection mode so the camera is always on and recording. Almost all dash cams can be wired to the car via an optional compatible hardwire kit. We always recommend using the services of a fully qualified, insured, and experienced auto electrician to do the installation for you. We now offer a nationwide mobile dash cam installation service from only £99..
By considering each of these features, we hope it has helped you to narrow down your choices and identify the perfect camera for you. Our website's filtering and comparison tools will also help you to choose the dashcam that meets all of your needs. However, if you're still not sure, please feel free to contact us.